It’s makeup week at Halloween Alley and our stores are offering free makeup demos. Here’s a great chance for you to head to your local Halloween alley store, get your look perfected and post a crazy pic on our social media. But the fun doesn’t stop here. We’ll even let you enter an easy ‘tag to win’ contest to take home free gift cards! Take a photo of yourself at our store with makeup on or while wearing a mask! Share it on our Facebook Page, Twitter and Instagram with our hashtag #MadeUpAtHalloweenAlley, and tag @HalloweenAlley between now and Sunday, October 23rd 2016. Each photo you share will count as an entry into our contest so the more you share, the more chances you’ll have to win! We’re looking for photos of your Halloween makeup or mask from or at Halloween Alley, no holes barred! 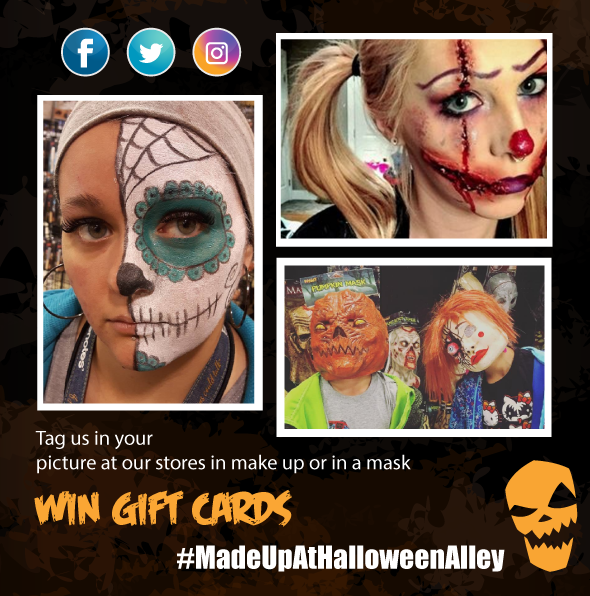 $25 Halloween Alley Gift Card to be used on anything in Halloween Alley stores. Two lucky winners will be announced on Monday, October24th 2016, so stay connected for the results! Subscribe to our newsletter to stay at the top of this! Contest valid for residents of Canada only. Good luck to all of our participants. We can’t wait to see your photos!